NASA's Ice, Cloud and land Elevation Satellite-2 (ICESat-2) will measure the average annual elevation change of land ice covering Greenland and Antarctica to within the width of a pencil, capturing 60,000 measurements every second. "The new observational technologies of ICESat-2 – a top recommendation of the scientific community in NASA's first Earth science decadal survey – will advance our knowledge of how the ice sheets of Greenland and Antarctica contribute to sea level rise," said Michael Freilich, director of the Earth Science Division in NASA's Science Mission Directorate. ICESat-2 will extend and improve upon NASA's 15-year record of monitoring the change in polar ice heights, which started in 2003 with the first ICESat mission and continued in 2009 with NASA's Operation IceBridge, an airborne research campaign that kept track of the accelerating rate of change. 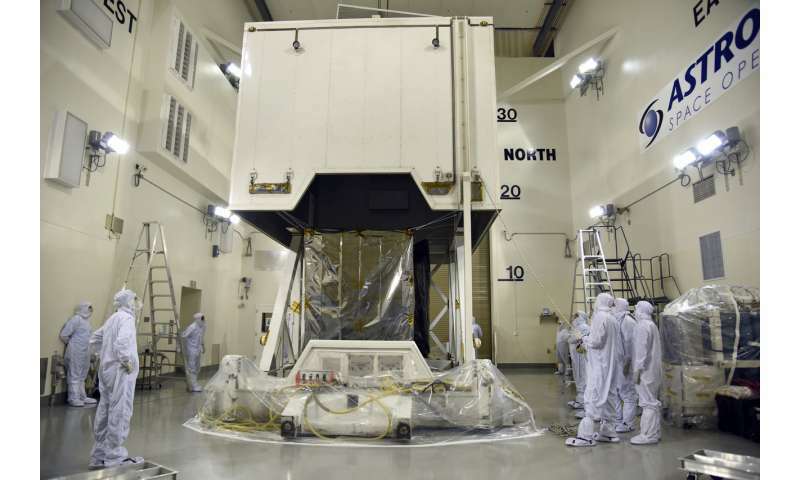 "ATLAS required us to develop new technologies to get the measurements needed by scientists to advance the research," said Doug McLennan, ICESat-2 project manager at NASA's Goddard Space Flight Center. "That meant we had to engineer a satellite instrument that not only will collect incredibly precise data, but also will collect more than 250 times as many height measurements as its predecessor." ATLAS will fire 10,000 times each second, sending hundreds of trillions of photons to the ground in six beams of green light. The roundtrip of individual laser photons from ICESat-2 to Earth's surface and back is timed to the billionth of a second to precisely measure elevation. Although floating sea ice doesn't change sea level when it melts, its loss has different consequences. The bright Arctic ice cap reflects the Sun's heat back into space. When that ice melts away, the dark water below absorbs that heat. This alters wind and ocean circulation patterns, potentially affecting Earth's global weather and climate. Beyond the poles, ICESat-2 will measure the height of ocean and land surfaces, including forests. ATLAS is designed to measure both the tops of trees and the ground below, which – combined with existing datasets on forest extent – will help researchers estimate the amount of carbon stored in the world's forests. Researchers also will investigate the height data collected on ocean waves, reservoir levels, and urban areas. 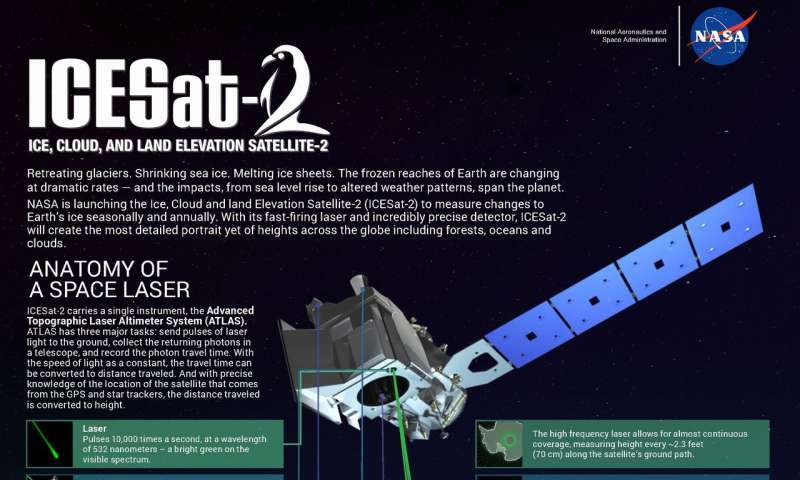 "Because ICESat-2 will provide measurements of unprecedented precision with global coverage, it will yield not only new insight into the polar regions, but also unanticipated findings across the globe," said Thorsten Markus, an ICESat-2 project scientist at Goddard. "The capacity and opportunity for true exploration is immense."